Dawn Solar Systems Inc. produces renewable energy systems that integrate seamlessly with a building’s architecture, providing energy security and reducing operating costs by replacing fossil fuels and electricity with solar energy. Residential and commercial systems are available today that can provide electricity along with hot air and water for heating and cooling, all harvested from a shared roof or wall surface. That is the pitch that Dawn uses to describe their solar collectors hidden under the roof and/or walls of your house. 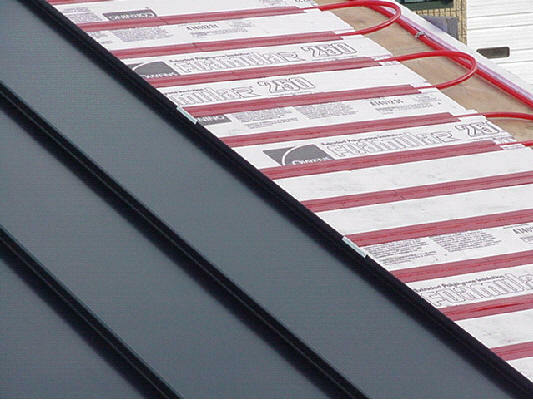 The system is installed during initial construction or a roof replacement. Depending upon location and application design, an open or closed loop system can be created as fluids are pumped through the system and cycled through conventional heat transfer and distribution systems. The following applications can be used with the heat collected in the system. Their system is compatible with several commercially available roof coverings. The system occupies a one-inch layer between the building sheathing and underneath appropriate roofing and siding materials creating an hidden solar collector. The system is an “active system”; it harvests the suns energy by absorbing the heat into a fluid that is pumped through either a closed or open loop storage heat exchange and storage system. Closed loop systems are recommended in the north (with glycol protection), open loop systems may be used in the south. Dawn provides systems that produce solar electricity and solar hot water from the same area on the roof or wall. When coupled to a photovoltaic system the their system improves the output of the PV system by removing excess heat from the roof area and transferring the heat to space heat or hot water. Their systems can be coupled to DC pumps (avoiding the loss that occurs in converting the PV panel output from DC to AC) that in turn can be powered by the PV panels, further reducing energy consumption. Prices will vary with system location and complexity, but using a system that produces +/- 250 BTU per square foot, per day, a Solar Domestic Hot Water System (SDHW) furnished and installed on a turnkey basis by a dealer will cost in the range of $7,000.00 to $8,000.00, not including roofing or siding systems. They have working installations in Colorado, Connecticut, Maine, Massachusetts, New Hampshire, New Mexico, Texas, and Vermont. Systems are scheduled for installation in Arizona, Florida, New Jersey, New York and Utah later in 2005. Ever since I found out that a PV's efficiency goes down as it heats up, I've been thinking that it would make perfect sense to couple a PV with a solar hot water heating system that would act as a heat sink for the PV. It looks like these guys have done just that. Simple and brilliant. Thanks for digging this one up, Jim. That's great for something like a swimming-pool heater, but for purposes where you want a glazed collector (year-round DHW) the goals of heating water and using the PV at max effciency are in conflict. Its great for a swimming pool heater, as you point out E-P, or for preheating water that is later sent to a hot water heater (preferably a tankless one) to heat to the desired temp for domestic hot water uses. It doesn't work as a preheater in most of the north. Either you glaze the collector to make it warm enough to be useful in winter (and lose efficiency from reflection and overtemperature), or you don't and you have to keep it drained much of the year. I would suggest that anyone interested in this system read the SRCC certification report, with particular attention to the heat output under various conditions. The system can produce some useful heat output under some conditions, but its output would be very limited in northern climates. Я думаю, что неэффективный сбор тепловой энергии солнца с помощью крыши эффективен только в солнечной Калифорнии и т.п. Нам,жителям 53 параллели надо думать о более эффективных коллекторах, что бы помочь основной печи на дровах. I think, that inefficient gathering of thermal energy of the sun with the help of a roof is effective only in solar California, etc. To us, inhabitants of 53 parallels it is necessary to think of more effective collectors what to help the basic furnace on fire wood. Yes! Keeping in mind the drastic environmental changes and rising fuel prices going Solar is one option open to all at minimal investments. The Solar Water heating systems are so easy to install and most of them come in a Do-it Yourself kit, With the technological advancement the once heavy, bulky hard to move panels are now available widely in light weight easy to carry by one personal only packages. The advancement in technology is not only limited to light weight, but for those concern about the aesthetics of the panels, the good news is that the panels are now available with a variety of trim colors to choose from and can be easily matched to your roof. Saving about $25.oo on ones electricity bill every month on a residence of 4. We all use hot water, as one of our basic needs and what can be a better way, than helping our environment, saving our resources and ourself's some money other than by investing in a Solar Water Heating System. 2. www.powerpartnerssolar.com - one of the many manufacturers of certified Solar Water Heating Systems available. One place I saw the light weight panels and trim color options I was mentioning earlier. We are manufacture of flat solar collector and water heater in China. We are certificated by SOLARKEYMARK, and CE. I recommend to build your own installation - people don't realize how easy and inexpensive this is. My friends built solar installations and saved BIG. While some of the comments have discussed how this would be impractical in the cold harsh winters of the north, down here in Atlanta our winters are much milder. I think this will catch on as more and more people catch the green wave. As regards DIY... this may be a project some might tackle, but I believe the majority of folks would do well to request a professionals help. I've being researching for some new and good ideas for building new house and reading your blog, I found your post very helpful :) . I thought I would leave my first comment. I don't know what to say except that I have enjoyed reading. Great idea. I wonder how far south a person would have to be for this to be cost effective? I live in Missouri and this seems to be one of the points that some of these energy efficent ideas work or don't work. Just planned to get on of these. For more than a decade, the solar power has been the main agenda of the green movement all across the world. The green movement emphasis on the balance between the environment and the elements on the earth. It helps on reducing the pollution in to our air. wow this is so interesting. i just love the new technology. I think this will be he trend for future innovations. I like the idea and facts presented on the article, it captures my interest. Thank you for sharing this informative post. I have to agree with those who praised the blog post above. I really enjoyed it and it made me quite curious to see what we are going to see or get on this website in the future, it's exciting for me. If you want to read good and informatics blog, then read this one because its information is sound and effective. A large number of visitors come on this blog for getting bonafide information. Knowing more about the kind of building materials used in our homes can be helpful in order to lower utility bills. We are very fortunate these days as we can customize our living spaces and have contractors follow exactly what we want for our homes to look. No longer do we have to depend on real estate magazines for with the help of a good contractor, we can custom-built our homes and even opt for 'green' construction materials. In this way, we get to live in the house of our dreams, built just the way we like it at the same time do good for the environment. From the flooring to the ceiling and roof, a responsible home owner take the time to learn about basic information regarding construction and the materials used in building your house. In this way, you will be able to know about solar collectors and not only will you have a fully functional hjousehold but you will also get to cut bacdk from your monthly utility bills. You will also know which parts of your house needs repair or replacement already. With skilled contractors, you can request to cutomize your household and turn it into a 'green' one to help you cut down with the monthly utility bills and look for more practical ways but still live comfortably in your abode. These days, we learn about various ways on how to be frugal and not depend on new materials all the time. The same goes with construction and home remodeling projects as you can ask your general contractor to opt for 'green' building materials to be used for your home sweet home. Solar power is one of the most efficient and low cost source of energy. This new technology have a lot of benefits not only on human but also for the environment because it can help lessen the pollution. For example when we use solar powered car instead of diesel.